Taste of Home Test Kitchen. No one will guess these sweet treats with the candy bar center start with store-bought dough. Roll them in colored sugar…or just dip the tops for even faster assembly. Instead of using miniature candy bars, slice regular size Snickers candy bars into 1-inch pieces for the centers. —This yummy sweet treat recipe come to us from the Taste of Home Test Kitchen. In a small bowl, beat cookie dough and flour until combined. 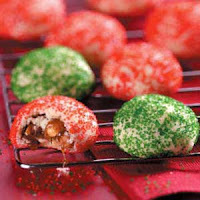 Shape 1-1/2 teaspoonfuls of dough around each candy bar. Roll in colored sugar. Place 2 in. apart on parchment paper-lined baking sheets. Bake at 350° for 10-12 minutes or until edges are golden brown. Remove to wire racks. Yield: 2 dozen.